2013 was an exciting time for our family because we welcomed the pitter patter of little feet (which is really more of a romp! romp! romp!) with Lacey's adoption. Working with Lacey on her behavioral issues took precedence over most DIY projects, including finishing my garage workshop – again. It was worth it though. Lacey has come a long way in learning dog manners, obedience and a few cute tricks, and is puppy stepping her way through socialization. Lacey still has a way to go with her behavioral rehab and we are looking for a good confidence building sport or activity she will like to do. It is a good time to reflect on my 2013 top posts and projects on Condo Blues with the new year and a fresh start right around the corner. Besides, that’s pretty much all I can do right now because I’m spending my holidays like this. Nurse Lacey is on the job. She hasn’t moved from my side since I had to stay off my feet. You may have already seen this picture if you follow the Condo Blues Facebook page. Decorating the Christmas tree is one of my holiday highlights. Every ornament has a story and I try to artfully place each one in just the right spot on the Christmas tree. No, silly, I'm not going to tape the holes in my tree together. I'm going to use the Duck Brand® Holiday designs (Seasonal Sweets, Snowmen, Holiday Bows, and Penguin) to make stars to fill the gaps in my Christmas tree. I'm teaming up with a fabulous group of bloggers to tour how we decorated our homes for the holidays. To get my idea machine running, I took the decorations out of storage and grouped them on the floor in mixed up combinations from the way I usually display them. I played with grouping items by color, theme (all snowmen, etc.) as well as things I haven't displayed in a while. 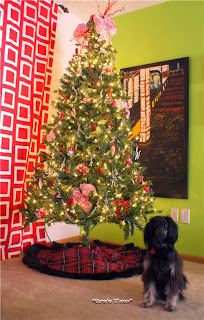 I realized I have plenty of Christmas whimsy decor if I change how, when, and where I use it. 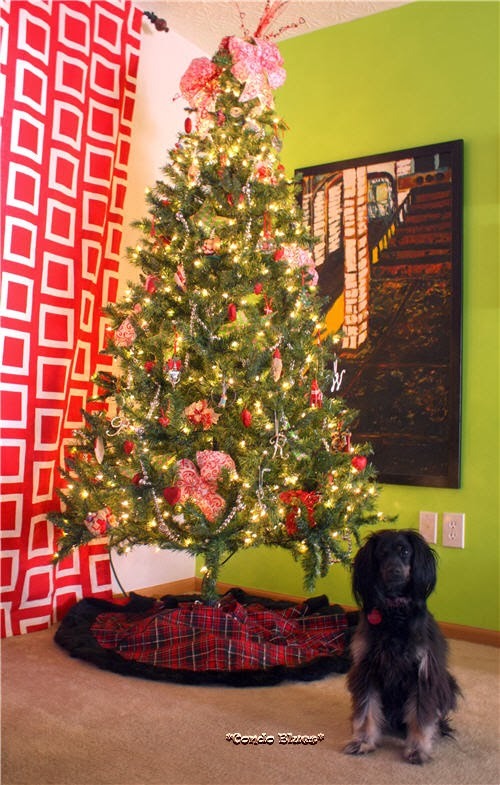 This year I decorated using red and bright green. It really sings with the red curtains and lime green accent wall in the living room! I clustered snowmen in the bathrooms, wood Christmas decorations on the end tables, and created my first North Pole Christmas mantel. Let's start at the top! I just cannot believe that Christmas is almost here! 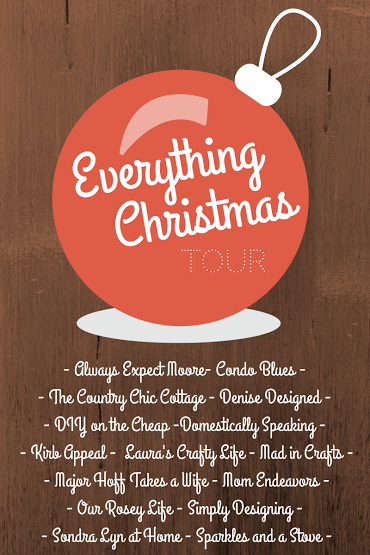 Join me and get ready to Be Inspired as I participate in the Everything Christmas Tour! 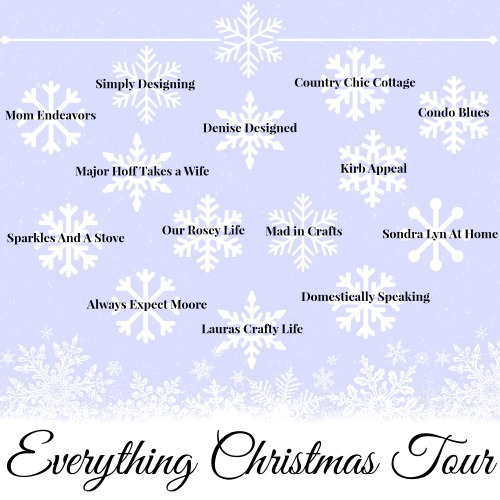 What is an Everything Christmas Tour you ask? Well...because it seems as though we are all running a little behind, I thought you could use some Inspiration, Motivation or just help getting into the Christmas Spirit! To do that, I am participating with a few other bloggers, fourteen of them, to be specific, as we spend a week sharing Everything Christmas with you...Mantels, Home Decor, Porches and Wall Designs! Miss 3 of 10 is a magical child. She went to Diagon Alley with her family. Her wand picked her in the Ollivander's show at the Wizarding World of Harry Potter. Lucky kid! I wanted to give her a Christmas gift that helped her remember that day (besides the wand souvenir her parents bought her in the gift shop.) Miss 3 of 10's favorite Hogwarts house is Ravenclaw. 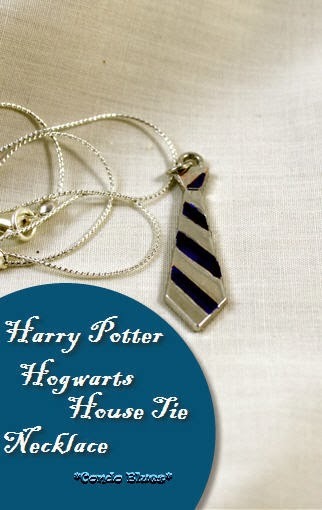 I made her a Hogwarts house tie necklace for Christmas. This is a Sponsored post written by me on behalf of Duck Brand provided by ShurTech Brands, LLC for SocialSpark. All opinions are 100% mine. There are affiliate links in this post for your convenience. I made dried pumpkin treats for two deserving and out of state doggies who love to exchange Christmas gifts. Well, their humans like to exchange Christmas presents. The dogs just go along for the ride. I saved two empty natural peanut butter jars from a fate worse than the recycling bin. The BPA free plastic jars are a good size and will survive shipping, but they are a little plain. Let's change that, shall we? One of the things I enjoy about the holidays is selecting the perfect gift for my friends and family. 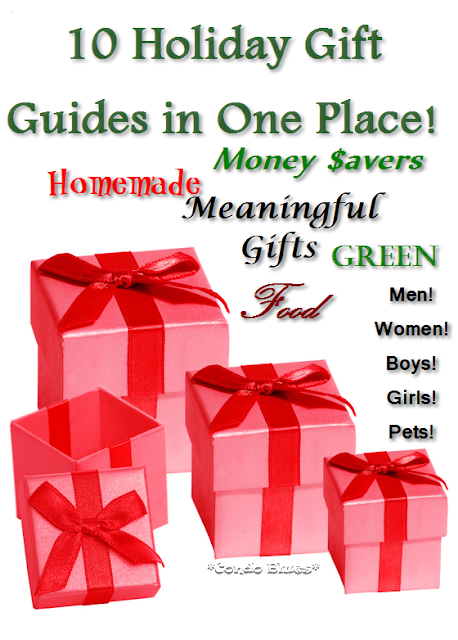 I need a few ideas for my hard to shop for people on my gift list and figure since I'm combing through Christmas gift guides for ideas, you might be interested in what I found too. Tis the season to get gifting, fa-lalala-la-lala-la! 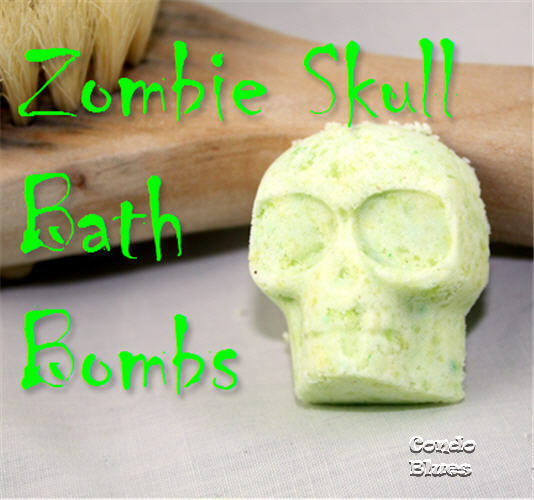 One of my favorite gifts to give (and get, if you are listening Santa,) is homemade soap. This year, I'm putting my lavender bushes to good use. 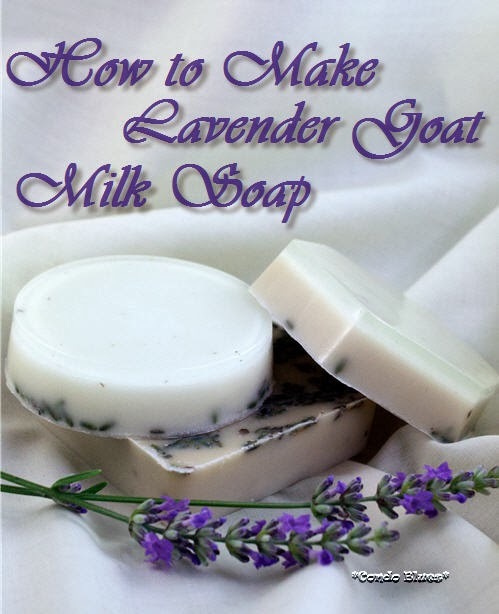 I'm making quick and easy calming lavender soap to give as Christmas gift exchange/teacher/hostess gifts. Pin this post to Pinterest! Share it with your friends! I use tablecloths to hide the fact I need to refinish our dining room table and haven’t gotten around to it. Lacey likes my tablecloths because she figured out how to use them to pull things off the table and into her eager mouth. I guess I better get some placemats, huh? I got my inspiration for this project from some of the little bits of supplies I wanted to use up while I was clearing a path through the crap meticulously cleaning and reorganizing my craft room. I have this preconceived notion that the only way to save money at a warehouse club is to buy giant sizes I don’t have room to store of products full of stuff I won’t buy due to additives, etc. that won’t save money for our small family of two people and the most cuddly dog that ever lived. I got almost an equal number of yeses and noes when I asked Can Small Families Shop At Warehouse Clubs and Save Money? I figure I’ll never know for certain unless I shop at a wholesale club and find out myself. I accepted an invitation to a holiday blogger event at BJ’s Wholesale Club. I didn’t think there would be much I would want to buy there, but tried to go with an open mind about what I’d find. If nothing else, I figured I’d find things that are useful for The Most Fabulous Readers on the Planet (that’s you!) which is the point of inviting me to this event in the first place. I bought a bought a Tom Baker Era TARDIS Key Keychain here shortly after I discovered the classic Doctor Who episodes playing on public television and carried it for years until it wore out. For those of you who don’t know your Who, Doctor Who is a British science fiction show about a Time Lord named The Doctor who travels through time and space in his ship the TARDIS (Time And Relative Dimensions In Space) which looks like a police box and saves the universe from bug eyed monsters. The show first aired from 1963 to 1989 and took a little break until they made a Doctor Who TV movie in 1996. The BBC brought Doctor Who back in 2005. This year marks the 50th Anniversary of Doctor Who. I put together a collection of Doctor Who DIYs and crafts to celebrate the geekiest week of the year. On November 22, 2013 the BBC will simulcast the Doctor Who 20th Anniversary Special around the world and, if you are lucky, in 3D a local theater! Pin this list of ideas to your Pinterest boards for later! Share it with your friends! Do Clothing Designers Hate Women? I am so upset on what was supposed to be a happy occasion. Husband took me to the Rock and Roll Hall of Fame for my birthday. I used the birthday card to visit since I haven't been there which is practically criminal considering I live in Ohio, have family we visit nearby, and I named a dog after inductee The Ramones song Blitzkrieg Bop. If you follow @condoblues on Instagram you might have already seen this photo. The Rock Hall part of the day was great. Husband and I appreciated how much space the museum devotes to the country, jazz, and blues legends that influenced and created what became rock and roll. Out of all of the museums I visited this one has the best soundtrack. I used to pop a couple of tennis balls into the dryer as a fabric softener free way to fight static cling until Lacey came to live with us. The sound of bouncing tennis balls she can't play with drives her (and us) bazonkers! Dumping the dryer balls for summer worked OK but I need to come up with a less noisy and non toxic chemical free solution to keep us from getting shocked by static electricity from our clothes during the dry winter months. Becky from Glue and Glitter was in a similar situation and made a fantastic solution - DIY Dryer Sheets! Check out Glue and Glitter's DIY Dryer Sheet tutorial here. Husband and I are so occupied with an interior house wide, declutter and donate mission that we haven’t paid much attention to the outside of the house. By the time we realized we should keep our lovely compost and spendy topsoil from eroding during the winter with mulch, the stores replaced their garden supplies with Christmas decorations. Last year I thought I was being a smarty smart when I raked all of the fallen leaves from the front yard into the flower beds to use as leaf mulch. That didn’t work very well. I didn’t shred the leaves. The first big gust of wind blew my leaf mulch out of the flower beds and back into the yard. Lacey was glued to my side all weekend. I know it is because she loves me. It has nothing to my cutting, gutting, and drying pumpkins into treats for her on Lazy Budget Chef. This is a great time to get a deal on discounted Halloween pumpkins and make them into dried pumpkin dog treats to give as Christmas gifts. Yes, dogs get Christmas gifts in this house. Always! 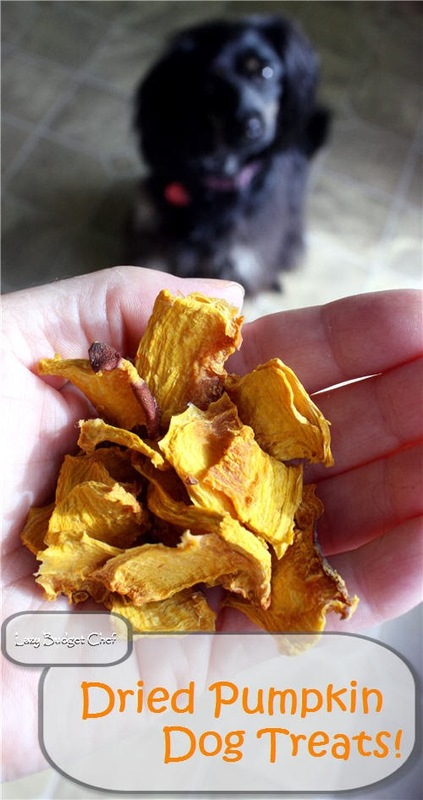 You can make my pumpkin jerky treats in the oven if you do not have a dehydrator. Learn how I make allergy free dried pumpkin dog treats on Lazy Budget Chef. It only took me 8 years to realize I should do something to protect the chairs on my front porch from rain and winter snow unless I want to keep making my chairs over every two years or so. That is not a difficult thing to do. But I’d rather spend that time working on a new project, like helping our girl Lacey become a balanced and confident dog. 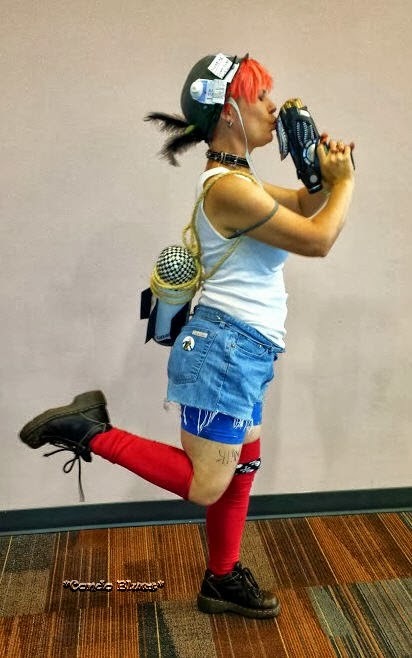 That project gives kisses! My chair projects do not give me kisses. One of my very best girl chums celebrates Mexican culture. That means a big chunk of her October holiday decorations are actually El Día de los Muertos (The Day of the Dead) decorations over Halloween decorations. I found some Día de los Muertos sugar skull fabric while surfing Etsy. Somehow, the fabric ended up in my mailbox. It is funny how often that happens when I surf Etsy. I took advantage of the situation to try something I have wanted to do for a while – use Modge Podge on fabric. I made Day of the Dead flower pots as a gift for my friend. I used Outdoor Mod Podge in case my friend wants to use them outside. After I had a few coats of indoor craft paint on the flower pots, I realized the paint will not hold up outdoors and switched to spray paint. That’s why the paint on the top of the pot looks a little lumpy shiny. Let’s pretend it adds character and is not an almost oops. 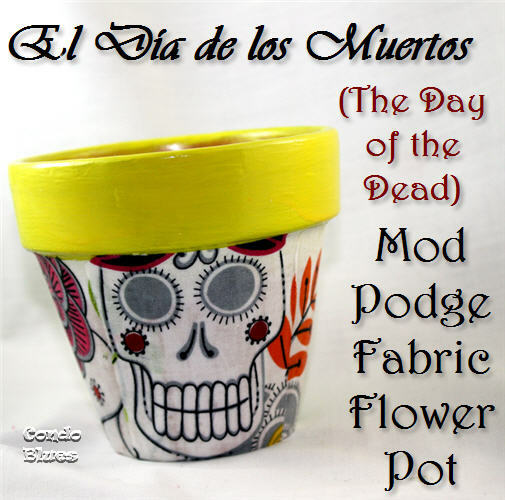 I’m not sure how my fabric Mod Podge flower pots will work with a real potted plant inside. To be safe, I’d use the Modge Podge flowerpot to disguise an ugly put practical plastic flower pot. 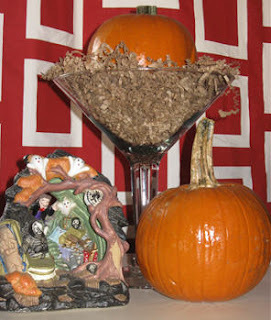 If that is not your thing, my fabric covered flower pots make a festive candy dish or candle holder. Lacey and I take several walks a day around our neighborhood. It is a good thing for both of us. Lacey drains her high energy in a positive way. I get off my duff and exercise. Everybody wins! Except weight. That, I am losing. Time to get some new clothes that fit! I love the Minions! They look like Twinkies with eyes. Long time readers know I am a fix it instead of replace it kind of gal. It is cheaper, it is greener, and it allows me to have a little more money leftover to sometimes spoil Lacey. I want Lisa to use her smart shopping skillz to keep me rolling in grass fed T bone steaks! Except when it comes to my High Efficiency (HE) dishwasher. At first, I liked the idea of saving water while it cleaned our dishes. Later a plumber told us since HE dishwashers use less water, the water heat up cycle is shorter than a standard dishwasher, and we have to jack the heat on the water heater to remove the grit on my clean dishes problem.